Petrolism means the use of oil revenues by a government to retain strong political control. Through a variety of mechanisms, governments in oil-rich states manage to avoid democratic reforms, engage in non transparent and corrupt practices, and rule out any economic diversification that can jeopardize their political grip. Researchers have devoted a great deal of effort to analyze the perverse link between oil and economic development. Particular attention has been given to top producers in the Middle East, but also to other oil emerging economies in Asia, Africa, and Latin America. In all these cases, it seems that oil and—other natural resources as well—have cursed the economies of the countries that heavily rely on them. Empirical research has provided strong evidence on the antidemocratic properties of oil and other minerals. Cuba is perhaps the only non oil state that has extensively practiced petrolism. This is not the result of the island being blessed by Mother-Nature with large reserves of oil or because of the imposition of policies by a top oil producer or a superpower. Petrolism in Cuba is rather an endogenous outcome of the current political system. Petrolism in the Cuban context results from the Cuban leadership looking for alliances within the club of oil producers. In fact, two strategic alliances with top oil states have laid the cornerstone of the Cuban economy over most of the last fifty years. In the early stages of the Revolution, the former Soviet Union became the exclusive supplier of oil to Cuba. The Soviet Union was also the main source of military and economic support that underpinned the Cuban economy until the early 1980s. Most recently, after a woeful decade of economic performance that followed the demise of the Soviet Union, Cuba finally found in Venezuela the longed political ally and an oil supplier to replace the Soviet Union. Petrolist Cuba has stood out not just for halting the development of certain economic sectors, but also for neglecting them. A prosperous tourist industry in the fifties was a big loser during the first two decades of the Revolution. But the abandonment of tourism pales when compared with the dire situation of agriculture, a sector that suffers from deliberate and harsh policies against private farmers. Moreover, the ongoing phase of petrolism has put the once mighty Cuban sugar industry on the brink of extinction. Statements like this have given me a great incentive to write this paper. Recent proposals have focused just on the economic need for oil, disregarding the adverse implications of such policies for Cuba as well as for the United States. Throughout this paper, I intend to provide a broader analysis and address the neglected but most important dimensions of the Cuban oil issue. The paper is structured as follows. The next part of the paper briefs the reader on some of the outstanding works addressing the link between oil, democracy, and economic development. This is followed by a review of the different stages of petrolism in Cuba and by an analysis of the implications for Cuba, both political and economic, of allowing U.S. companies to enter the Cuban oil market. 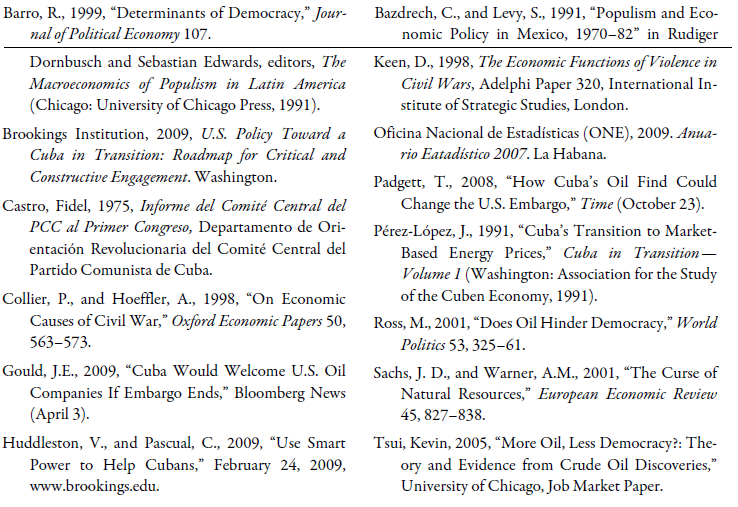 The literature on the link between oil, democracy, and economic development is relatively young. Most oil producers have become important players in the international arena after the surge in oil prices in the 1970s. Since then, oil has been at the center of many world crises, political as well as economic. Expectations that oil production and revenue would drive its producers into modern societies have not materialized. In spite of the ups and downs of the oil market, the truth is that oil states have received extraordinarily large amounts of revenues over the past 40 years, which they have mismanaged. After many appalling episodes, there is enough reason to believe that oil, as well as other natural resources, have some odd properties that impede democracy and economic development. The repeated failures of oil economies to grow and develop have sparked a plethora of empirical works. Empirical research on the odd properties of oil has had two major aims. First, researchers have worked to confirm the negative relationship between oil, on one hand, and democracy and economic development on the other. A second aim is more ambitious, since it tries to explain the mechanisms through which oil carries out such a perverse outcome. Several studies have documented that the share of oil exports as a percent of the GDP has a negative effect on democracy (Barro, 1999; Ross 2001). Bazdrech and Levy (2001) also concluded that oil contributed to prolonging single-party rule in Mexico. The adverse effects of oil begin before a country becomes an important producer and exporter. Large oil discoveries can push a country away from the democratic path. Authoritarian states try to maximize the benefits from oil by monopolizing production through a state company (Tsui, 2005). Also within the political dimension, other empirical works have found oil and other mineral resources highly accountable for civil wars. Although oil is not the only cause of armed conflicts, it helps to unleash wars and prolong them by financing the parties involved in these conflicts (Keen, 1998; Collier and Hoeffler, 1998). From a more economic standpoint, researchers have also proven a negative statistical association between oil (measured as ratio value of oil exports/ GDP) and real GDP growth (Sachs and Warner, 2001). Regarding the causality issue, Ross (2001) deserves credit for studying the causal mechanisms that make oil states more authoritarian. Ross’ theoretical framework relies on three main concepts related to oil production: rentier, repression, and modernization effects. A rentier effect occurs when a government uses oil revenues in a populist way. Governments literally squander money in social projects of doubtful efficiency or lower taxes. These actions ease pressures for democratization, or inhibit the society from demanding transparency and accountability for antidemocratic actions. The way authoritarianism has reemerged in Russia, thanks to skyrocketing oil prices, is a good example of how oil can hold back a democratic process. The Middle East countries are cited as places where oil revenues have discouraged further demands for democratization. Oil wealth can also help rulers to build up a strong security machine and large military forces. This is called the repression effect. Oil revenues have enabled producers in the Middle East and Africa to spend heavily on the military. Besides clamping down any vestige of domestic opposition, a huge military buildup encourages rulers to military adventures abroad. The repression effect fits well in the cases of Iraq, Libya, and Iran, among others. The modernization effect provides another explanation for the flaws of oil societies. Oil economies have few incentives to undertake social, cultural, and economic changes that make economic development team up with democracy. Natural resource led growth fails to modernize a society. Oil can bring a lot of revenues, but fails to diversify the economy and create an autonomous workforce. The main findings of Ross’ study can be summarized as follows: (1) a high share of oil exports has an adverse impact on democracy; (2) oil is more harmful in poor countries. This result is consistent with the experiences of countries such as Great Britain, Norway, and the United States. They were all democratic societies with high levels of income when oil started to play an important role in their economies; (3) upon these previous findings, it is straightforward that the impact of oil on a young democratic country with an emerging economy is little less than devastating; (4) oil exports help to explain military spending: they are positively correlated; (5) the adverse impact of oil spans all less developed producers and it is not exclusive of the Middle East countries; and (6) unlike oil and other minerals, food exports impinge positively on democracy. In sum, the empirical evidence of oil impeding democracy and economic development is overwhelming. The Cuban case supports the plethora of research on this issue, but also adds some interesting and particular features. Cuba has traditionally been a net oil importer. Fifty years of Revolution have not changed that, but oil has become a key variable within the political equation and thus the alliances with ideological partners with vast oil resources. In the Cuban official speech, oil is not just another commodity to buy in the world market at a given price. Oil is more than that. Oil is the most worshipped of all natural resources, a commodity that defines whether a country is rich or poor. Nuestro país es pobre en recursos naturales, no posee yacimientos de carbón, ni petróleo en cantidades importantes hasta donde reflejan las investigaciones realizadas, ni energía hidráulica por la extensión y configuración de nuestro territorio. Conclusions from this statement are straightforward. According to the Cuban government, a country endowed with hundreds of beaches and other natural beauties, a very rich soil, an extensive maritime platform, a very strategic location and even one of the largest reserves of nickel in the world, is not a rich country. Only countries favored by Mother-Nature with large energy resources are rich. Driven by this cult to oil, Cuba embraced an economic model where the economy was subordinated to political priorities. One of the implicit goals of this model was obtaining oil at the lowest political cost. Strong bonds with the former Soviet Union ensured oil supply to Cuba on favorable terms over the first three decades of the Revolution. Cuba established a commercial relationship governed by bartering instead of by market prices. Bartering (oil for sugar) with the Soviet Union spared Cuba the skyrocketing prices that severely hit oil importing countries in 1973 and 1980 (Pérez-López, 1991). However, the costs of this distorted relationship exceeded its benefits. Cuba sacrificed economic efficiency and disregarded its comparative advantages in order to ensure the survival of its political regime. To fulfill its commitments with the Soviet Union and other socialist countries in Eastern Europe, Cuba relied on its historical tradition as sugar producer. The Soviets paid above market prices for Cuban sugar and furnished the island with oil, machinery, and intermediate inputs. Then, Cuba’s sugar production was marked by militarization, an excessive consumption of oil and other inputs, and over-mechanization of sugar cane agriculture. The latter was not a wise choice, from an economic standpoint, but a more flexible approach in sugar production necessarily required reforms and concessions to private famers, an option politically unacceptable. Cuba also embarked on a process of industrialization featuring oil guzzler industries across the economy (nickel, textile, metallurgy). Tourism and other services, which by nature are more efficient in private hands, were the big losers of this policy and were left playing second fiddle. In the late 1980s—the last years of the Soviet era— Cuba was allowed to re-export three million tons of oil annually (Pérez-López, 1991). With the doors to Western credit markets closed, Cuba was desperately looking for new sources of convertible currency. Ironically, Cuba had become an oil exporter and sugar importer to honor its agreements with the Soviet Union. The episode of Cuba as an oil exporter was the pinnacle of petrolism in the Soviet era of socialist Cuba. The benefits that Cuba received from this anomalous trade did not last long. The demise of the European socialist block left Cuba adrift. The island entered its worst economic crisis ever, called Special Period, which lasted over fifteen years. The Cuban economy indeed suffered like never before, but some tepid economic reforms showed a light. The Cuban government succeeded in jumping off the Soviet ship without losing political grip. Within the new economic framework, the Government had no other option than revive tourism and tolerate some forms of private property and self- employment. Likewise, the legalization of the use of the U.S. dollar ended an inveterate formula in Cuba where economic prosperity was quite linked to political loyalty. The Cuban economic system remained highly centralized, but the market had finally made some inroads in the island. Throughout the decade of the 1990s, Cuba managed to increase domestic oil production from 0.67 million tons to 2.7 million tons in 2000. The lack of support from a magnificent oil supplier meant a break in the petrolist policy. However, the arrival to power of Hugo Chávez in Venezuela in 1998 brought about the windfall that Cuba had long awaited. Cuba established an excellent relationship with Venezuela since the early stages of Chávez’s government. However, it was not until 2004 that the economy made another turnaround, this time against the timid liberalizing steps of the 1990s. The economic backing of Venezuela to Cuba has been widely addressed. There is no need for this paper to elaborate on this issue. It is just worth to point out that petrolism has blossomed in Cuba over the past four years. Although the trade terms with Venezuela are not public, it is estimated that the South American country supplies Cuba with 90,000 barrels of oil per day. Even more important are the revenues Cuba receives from professional services and other transfers from Venezuela. Thanks to those direct and indirect flows of petrodollars, Cuba is running an astonishing trade deficit (merchandise) of $10 billion a year, roughly 18% of Cuba’s GDP.1 This outstanding amount of revenues from exported professional services, with no precedent in the history of the Revolution, has become crucial to underpin the Cuban economy. Economic support from Venezuela has emboldened the Cuban government to fight back any seeds of capitalism on the island. The closing of small joint ventures, the artificial overvaluation of the Cuban Convertible Peso, the reduction of self-employment permits, and more militarization of the economy define the nature of this recent episode of petrolism in Cuba. The extreme reliance upon medical services has introduced a new distortion in the Cuban economy. Even some Cuban economists within the island have expressed their concern on this issue. In spite of the merits of Cuban physicians, only a political ally as Venezuela can pay so lavishly for their services. Cuban economists are fully aware of the big risks this policy entails. They know the economy is walking on a razor’s edge, given the fragile conditions of the external sector. During the Soviet era, Cuba relied on sugar, a tradable good, but now the island depends of a kind of service that is a far cry from being tradable in the world market. Moreover, the Cuban economy is now afflicted by a Dutch disease, since Venezuela’s generosity is nothing more than the result of an abundance of petrodollars. Instead of developing more marketable services— which necessarily involve private investment and the development of small companies—the Cuban government has scaled up the use of a traditional formula: thousands of professionals, under government control, go overseas to work in a friendly environment. They receive just a small fraction of the revenues they generate. This new episode of petrolism has allowed Cuba to re-export oil once again. Reportedly, revenues from oil exports in 2008 surpassed $800 millions. Hence, oil has become one of the top three sources of external revenues for Cuba. Recent changes in Cuba’s leadership have not hinted any deviation from petrolism principles. However, the new leader, Army General Raúl Castro, seems to be aware of the dangers of an excessive dependence on Venezuela, and thus has decided that it is time to diversify sources of oil supplies. It is not a coincidence that Raúl Castro toured last April a group of countries that are not just friendly towards the Cuban regime but also important oil producers: Russia, Angola, and Algeria. The real potential of the Cuban oil industry is not accurately known yet. In fact, local production peaked in 2003 at 3.7 million tons, but since then started to decline (ONE, 2009). Nonetheless, Cuba is betting on a big rebound for this sector driven by foreign investment. Cuba has authorized foreign firms to explore and drill in the northwest offshore sector within its Exclusive Economic Zone (EEZ). Companies from Spain, India, and Norway have already entered into agreements with the Cuban government for such privileges. Cuba is negotiating with Brazil’s Petrobras, a company that could become an important player in the offshore drilling in the island and it is also in talks with Angola, Russia and China. So far, U.S. firms have remained on the sidelines, but Cuba is trying to change that. Cuba leadership knows that oil is the powerful Trojan horse that could tear down the embargo. This explains the game that Cuba is playing. The stunning announcement by Cuba Petróleo (Cupet) that Cuba lodges 20 billion barrels of oil offshore is part of this game, though Cupet’s exploration manager, Rafael Tenreyro, denies it (Padgett, 2008). Cupet’s estimates far exceed the estimates by the U.S. Geological Survey, which places Cuba oil reserves between 5 and 10 billion barrels. Other experts have seriously questioned Cupet’s estimates. Siren songs from Cuba have found receptive listeners in the Unite States. Huddleston’s words (cited above) are not an isolated statement. In fact, allowing U.S. oil companies to explore in Cuba is one of the ideas set forth by the Brooking Institution (2009) to improve relations with Cuba. Advocates of lifting restrictions on U.S. oil companies mostly allege economic reasons. The development of new sources of energy is now a top priority in the United States. The idea of drilling offshore has many supporters in the United States, so the corollary is that an “oilier” Cuba will fit well in this framework. However, the Cuban oil issue has many strategic implications for Cuba, as well as for the United States, that cannot be ignored. Agriculture will surely receive the biggest negative blow. Imports of foods will rise and the chances to overhaul Cuba’s troubled agriculture will go away. Further concessions to private farmers would look as an improbable scenario. A huge inflow of petrodollars to Cuba will also hurt tourism. As it has happened since 2004, Cuban authorities will lose interest in exploiting the full potential of tourism. They will just focus on resorts and some tourist niches like Varadero, where foreign visitors are isolated from the population. Tourism to big cities, which promotes interaction between foreigners and Cubans and directs some money into the pockets of ordinary citizens, will continue to lose ground. Manufacturing will not go unscathed either. An offshore oil boom could finally kill the sugar industry. It is noteworthy that Cuban officials court U.S. oil companies, but never mention the island’s potential as an ethanol producer. The Cuban leadership does not like cooperation in this sector, as they do not want thousands of Cuban workers and farmers interacting with U.S. firms. The revival of the sugar sector, both agricultural and industrial, demands liberalizing steps that the Cuban government refuses to take. Oil and sugar do not really mix. Biotechnology and pharmaceuticals, in which Cuba has made some notable strides, could fall in the doldrums as well. Over the last 50 years, Cuba has shown a long record of replacing rather than adding economic activity. Once the government gives priority to one sector—the one that provides revenues without political risk—they let others stagnate. The tertiary sector, which has a great potential in Cuba, will never blossom in an economy driven by oil. Cuba has thousands of talented artists, sportsmen, physicians, musicians, and many other professionals, living in the island or abroad. Nonetheless, the island will not reap the benefits of these assets until a radical reform opens the doors of the market to Cuban professionals. Under a massive inflow of petrodollars, the Cuban government will have little incentives to do that. As researchers have shown, oil starts its harmful work from the moment significant oil wealth is discovered. The mere expectations that U.S. firms will enter the Cuban market will abort timid attempts to liberalize the economy. The arrival of U.S. firms to explore and drill offshore in Cuban waters will embolden political hardliners, those who adamantly refuse any kind of small moves towards democracy and market economy. The advocates of market reforms—who now can barely make a comment in favor of liberalization— will be left in a much weaker position. There is an interesting argument in favor of large oil production in Cuba. The idea is that it will free the Cuban leadership from the influence of Hugo Chávez. The implicit assumption is that energy self sufficiency will ease conditions for the Cuban government to undertake reforms. Another implicit and wrong assumption in this argument is that Venezuela is responsible for the stagnation of the Cuban economy. It is worth being reminded that Venezuela did not impose such dependence upon Cuba. Cuba rather sought it, the same way it did with the former Soviet Union. The question is not whether oil comes from Venezuela or from the Cuban offshore. What is indeed relevant is that too much oil under the control of a non-democratic government is a boomerang. As long as oil supply to Cuba keeps fueling petrolism, hopes for economic liberalization will become more distant. As many studies have documented, oil booms in poor economies thwart economic diversification and the development of secondary and tertiary activities. Cuba will not be the exception. The best way for Cuba to become more economically independent is by overhauling agriculture. It will save the island billions of dollars in food imports, and will foster forward links with the rest of the economy. In particular, it will help rescue from stagnation the sugar industry and encourage ethanol production. In a nutshell, developed and democratic countries are not oil exporters, but rather food exporters. U.S. policy towards Cuba certainly needs to change. If the United States really wants more engagement and cooperation with Cuba, it has a wide range of options to choose from. Many of the proposals advanced by the Brookings Institution can work positively in this direction. Attempts to isolate the island have failed to promote democratic change. Banning family travel does not make any contribution whatsoever. Income levels of Cuban American families—not the U.S. restrictions—are the real constraint on the amount of money remittances to Cuba.2 With thousands of Cubans living in Latin America, Europe, and even Asia, circumventing U.S. restrictions on remittances is not a cumbersome task. Cultural and academic exchanges are also an excellent way to promote better understanding between the two countries. Baseball, boxing and other sport matches— which used to be held during Reagan and George H. Bush terms—would also contribute to generate a climate of distension between both countries. Cuba has been ravaged by devastating hurricanes. The U.S. government can design a contingency plan to provide humanitarian help to Cuba in the event of natural disasters. The Cuban people would be grateful for this act, which the rest of the world would also welcome. Enhancing the list of products U.S. companies can export to Cuba is also an option to consider. In addition, cooperation on environmental issues is an excellent way to help the island overcome five decades of deterioration and an awful record of protecting the environment. The U.S. Administration of President Obama has bet on green alternatives of energy production. Those who advocate allowing U.S. oil firms to invest in Cuba have forgotten that. Moreover, they seem to ignore how corruption has intensified in Mexico and Venezuela, the top oil producers in Latin America and both U.S. neighbors. Oil has nurtured corruption in Mexico, and corruption in turn has nurtured a dreadful crime industry in that country. Having a third oil oligarchy as a neighbor will not bring any benefit to the United States. There is a plethora of research that has shown that oil does not mix with democracy and economic development. Instead of being a blessing, oil and other mineral resources have been a curse for most emerging economies that rely heavily on them. Cuba maybe the only oil-importing country that has extensively practiced petrolism. The Cuban government has given priority to alliances with oil producers in order to secure oil supplies under very favorable terms. Cuba has used directly and indirectly oil revenues to avoid economic liberalization and concessions to the private sector. The current political honeymoon with Venezuela has led the way for a new stage of petrolism in Cuba. Cuba is now exposed indirectly to Dutch disease and its external sector is in a fragile condition. The new administration headed by Raúl Castro is aware of this weakness, but has not hinted deviation from petrolism. Once again, Cuba is looking to oil producers for help in the future. Cuba knows the oil equation is incomplete without the participation of U.S. firms. The idea of U.S. oil companies drilling offshore in Cuba has gained more adherents, and Cuba wants to take advantage of that. The true potential of the Cuban oil industry remains unknown. The economic benefits that the United States could gain from involvement in the Cuban oil sector are not at all certain. What is really certain is that oil richness will place Cuba further away from democracy and sound economic development. Under this scenario, both Cuba and the United States lose. 1. Figures obtained from statements by the Cuban Minister of External Trade and Foreign Investment, Rodrigo Malmierca, in April 2009. 2. Based on my personal experience and those of other friends and colleagues living in the United States, I can state that it is unlikely for a Cuban American family to reach the threshold of $300 dollars per quarter for money remittances to Cuba set by the Bush administration in 2004. Given the current tough economic situation in the United States and in Miami in particular, it is less likely that people who emigrated in the last 15 years—who are the emigrants with most relatives in Cuba—are in an economic position to send $300 quarterly to their families in the island.